Wonderfully light and spacious, this comfortable apartment is well-appointed and equipped with everything you need to ensure a relaxing and enjoyable stay. There is also a private terrace for your enjoyment as well as a billiard. Competitively priced, its quality, location and generous size make it a great valuable choice and a welcoming home away from home which is perfect for any guest. Here is a superb four bedroom apartment of 240 m2, set in the iconic Josefov Quarter. It will be difficult to find a better location in Prague, surrounded by the Old Town Square, the Jewish Town, the Republic Square and the Vltava River, you are next to some Prague's highlights such as the Astronomical Clock, the Old Jewish Cemetery, the St. Nicholas Church, the Church of Our Lady before Tyn and the Charles Bridge. The Old Town is considered as one of the most vibrant and lively area of Prague, with a lot of nightlife attractions, fine restaurants, trendy bars and traditional pubs. It is also close to the Parizska street, a haven for shoppers, famous for its fashion boutiques, luxury accessories and gourmet eateries. This location is one of Prague secrets, fashionable, friendly and brimming with street-side cafes and fashionable terraces. 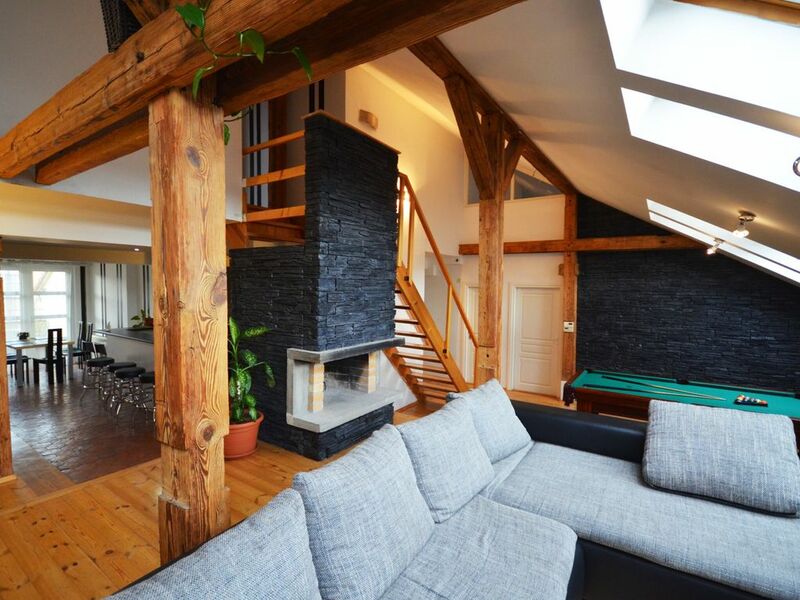 This penthouse apartment has its own character with a remarkable atmosphere. Bright, roomy and comfortable, the apartment comes equipped with all the home comforts you could need, is tastefully decorated and incredibly spacious. As a bonus a billiard is at the guest disposal. Prague benefits from an extensive transport network with metro, tram and bus systems. The metro is one of the best ways to get around being fast and cheap. It’s fairly easy to navigate and quite safe, and pocket maps are available at stations. The nearest station is "Staromestska". The Apartment U Obecniho Dvora is located on the fifth floor in a building without lift. The beauty and the superb location of this apartment, will make you forget the stairs, you can expect the finest from this unique apartment. Property description: 4 bedrooms, large living room, dinning area, kitchen, 2 bathrooms, separate guest toilet, office corner, dressing room and terrace. Beds disposition: 4 king size beds, 3 single beds and sofa bed. Highlights: Air conditioning, FREE WIFI, large SAT TV, home cinema sound bar, Bluetooth speaker for connecting iPods, MP3 players, Italian espresso machine, hair dryer, washing machine, dryer and ironing facilities. Medical and anti allergy mattresses, double sided oval make-up mirror, hair dryers, digital bathroom scale and safe. The apartment was perfect for our group of ten. It was clean, well equipped, and spacious. The location was great--close to most of the main tourist attractions. There are plenty of restaurants and grocery stores within walking distance. The only negative is the stairs--the apartment is 6 flights up and there is not an elevator. It was not a problem for our families but would be extremely difficult for many seniors or disabled guests. We stayed for 5 nights at this wonderful apartment! It was a family gathering for our daughters wedding. The party included bride and groom, brides parents (that's me!) son and partner, son and friend. Gasps of delight came from us all when we opened the door! Everything from the bedrooms, bathrooms, kitchen, sun deck were 1st class. The pool table was a constant form of fun! On the actual wedding day the apartment was full of wedding planners, hairdressers but everyone felt at home. The apartment couldn't have been better for such hectic preparations with fantastic wall to ceiling mirrors etc. Even the long walk down the stairs in wedding outfits (bride in long dress, train and veil!) became a brilliant photo opportunity. Will certainly recommend this apartment to friends. We had a great stay and the accommodations were awesome! Plenty of space and nice touches like coffee provided. The location was also great to the town of Prague. Overall very nice and we would recommend. Note: The spacious apartment is located on the 5th floor and it is quite the hike up the steps.